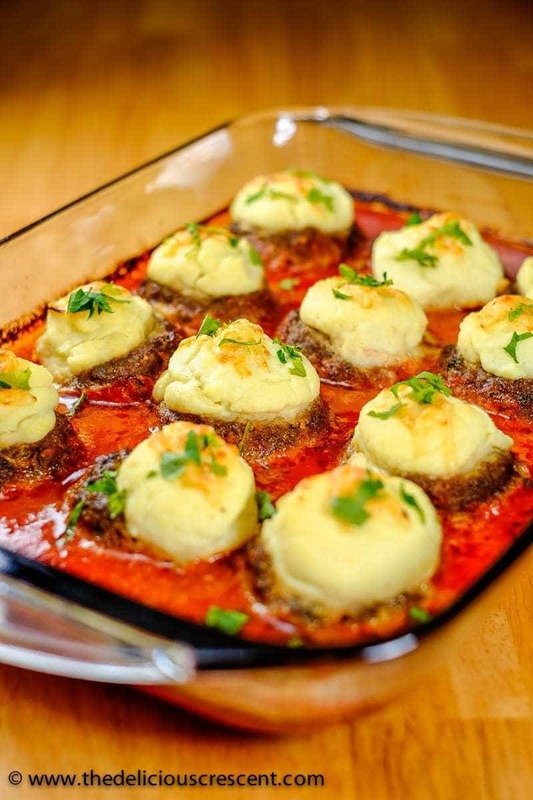 Creamy Cauliflower Stuffed Meatballs is an inspired version of a Turkish dish – Pasha’s Kofta. 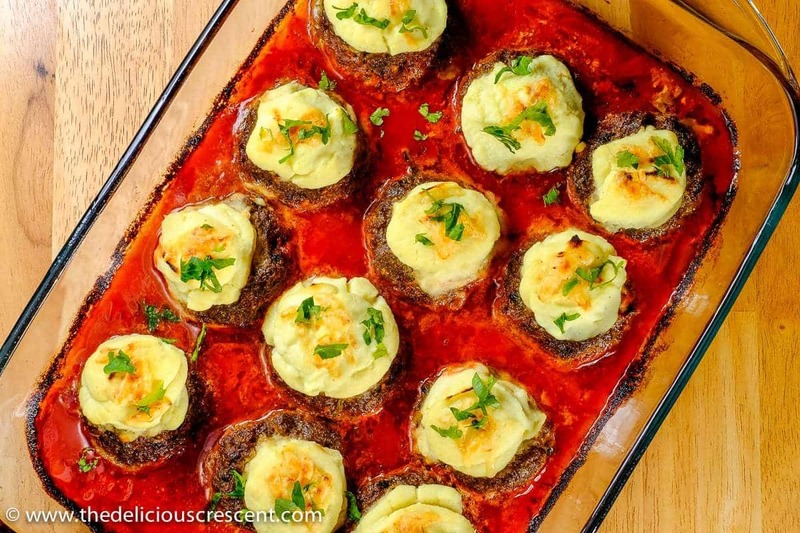 Lower calories/carbs, succulent meatballs, full of flavor and nutrients! Pasha’s kofta is typically made by stuffing meatballs with creamy mashed potatoes. But sometimes, there is a need for a change from the routine – for the sake of nutrition – when you need to lower the overall calories/carbohydrates, add a different set of nutrients or simply to use that beautiful cauliflower sitting in your refrigerator. Cauliflower has become some kind of a mother of all vegetables. It will cream, steak, rice, soup, bread, crisp, crust…….for you. Some example recipes are: Cauliflower Lemon Rice, Healthy Cauliflower Upma, Cauliflower Couscous with Moroccan Lamb Stew. It is so versatile, that it lends itself beautifully to dishes to create textures and consistencies that mimic other vegetables. And, that is all not in vain. Cauliflower is no dummy vegetable – it brings along its own bevy of nutrients to boost the dish. With its subtle flavor, it can linger in the background, let the other ingredients take the center stage, offer itself in myriad forms, while nourishing the whole dish. Cauliflower is part of the brassica family, commonly known as the cruciferous vegetables. It has become well known for its antioxidant potential and phytochemical content. Despite being quite low in calories, it is very high in nutrients – in fact, it made to the top 20 among the vegetables, when ranked by certain food scoring systems. It is very rich in vitamin C and a good source of vitamin K, vitamin B-6, folate and potassium. It provides choline – a vitamin like factor – which is supposed to play an important role in learning, memory and sleep. Due to its fiber and water content, cauliflower is very beneficial for gut health and promoting regularity. Its fiber content also helps with satiety and weight loss. This cruciferous vegetable contains indole-3-carbinol and sulforaphane – compounds that have been studied for their cancer fighting potential by preventing cellular mutations and reducing oxidative stress. 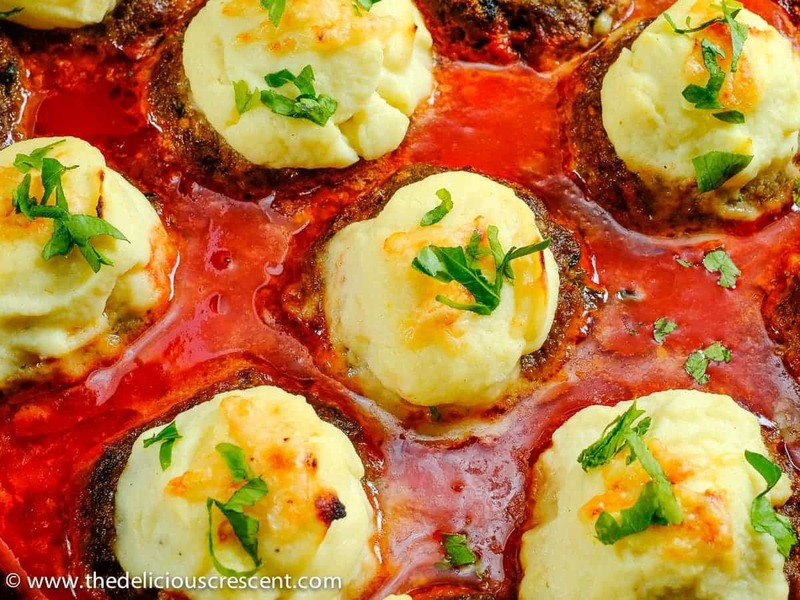 One serving of this creamy cauliflower stuffed meatballs provides 238 kcals, a good amount of protein – 20 g, just one carbohydrate serving, and 4 g of fiber. A good balanced flavorful dish for anyone! 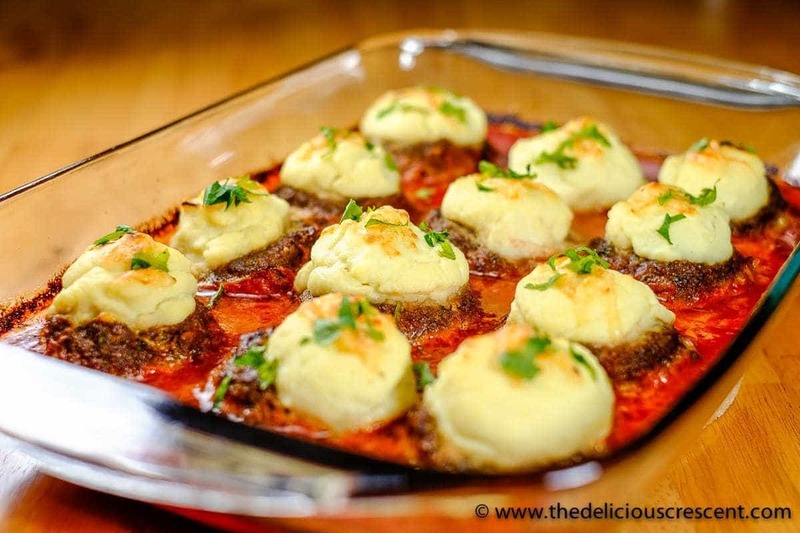 Creamy Cauliflower Stuffed Meatballs is an inspired version of a Turkish dish - Pasha's Kofta. Lower calories/carbs, succulent meatballs, full of flavor and nutrients! Combine all the ingredients for koftas (meatballs) in a mixing bowl. Knead it well for 3-4 minutes. Refrigerate for at least 30 minutes. Fill water in a steamer to just below the level of the insert. Bring the water to a boil. Place the insert and add the cauliflower florets over it. Cover and allow it to steam for about 10 minutes. Alternatively, may also cook the cauliflower in boiling water until tender. Drain the water. Heat the olive oil in a small skillet and sauté the garlic until soft but do not let it brown, if you do not want a roasted flavor. Blend half the cauliflower and garlic with some yogurt. Add the remaining florets and rest of the ingredients and blend it to a puree. Adjust the seasoning and consistency, using a little water if needed. But make sure to not let it become runny. The puree should lend itself to form a mound on top of the meat balls. Add the grated garlic and stir for 2 minutes. Add crushed tomatoes, tomato paste and stir 2-3 minutes. Add the spice mix, salt and mix well. If you want the gravy to be a bit creamy, may add the whipped yogurt and stir thoroughly. Adjust spice, herbs, seasoning, per taste. Simmer 5 minutes and set aside. The gravy will cook later in the oven. Divide the chilled kofta/meatball mixture into 12 portions. Shape each portion into a round kofta ball and set aside. Cup the meatball in one hand and using your fingers make a depression in the center, gradually making a well in the center of each meatball. Take a 9 X 13 inch ovenproof baking dish (I used a Pyrex dish). Pour half the prepared tomato gravy into the dish. Gently arrange the meatballs. Carefully pour half of the remaining tomato gravy around the meatballs, making sure the level of gravy stays below the edges of the welled meatballs. The leftover tomato gravy may be added about 10 minutes prior to end of baking time, as by then some of the gravy may have evaporated and you can use that extra portion to adjust the amount of gravy around the meatballs. 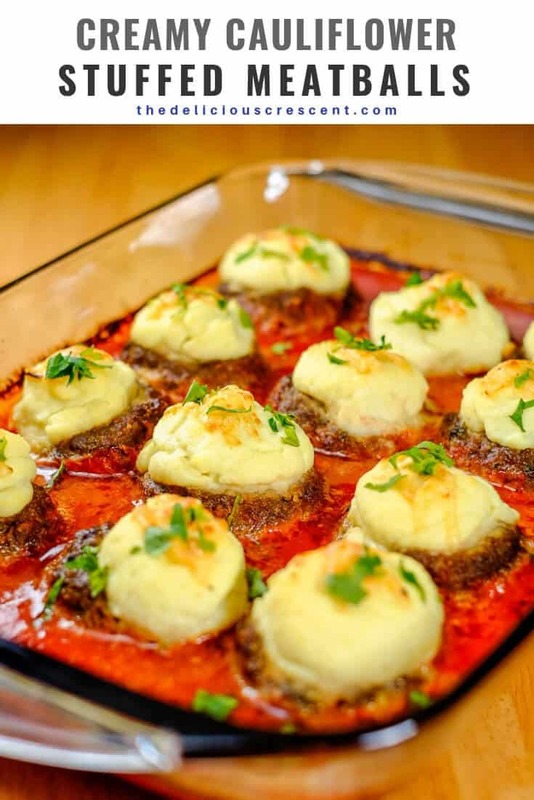 Using a spoon, portion out the creamy cauliflower puree into the welled area of each meatball. Top each filled meatball with some grated cheese. Place the baking dish in the oven and bake uncovered for about 35 to 40 minutes until the tops of the creamy cauliflower puree are golden brown. Garnish the creamy cauliflower stuffed meatballs with chopped parsley. A sprinkle of melted butter or ghee all over the dish is optional just for flavor or for a festive time. Serve this creamy cauliflower stuffed meatballs with a fresh vegetable salad. Instead of the 2½ cups crushed tomatoes + 2 tablespoons tomato paste you may also use 1/2 cup double concentrated tomato paste. If using tomato paste only then add 2 cups of stock or water. Kebab or kofta spice blend or grilling spice mixes are available at middle eastern or Mediterranean grocery stores and online. Breadcrumbs are not gluten free, unless you buy the gluten free version. *The sodium value may vary. The suggested amount of salt is just a guideline and may need to be adjusted. Check for any added salt in spice mixes, tomato paste and other ingredients and adjust. These meatballs look amazing! Love the addition of cauliflower! What a great dish to eat a little healthier and yet still packed with lots of flavor. Thanks :) Yes it is lighter than the potato stuffed ones and something different for a change. What a fabulous recipe! They look delicious! What a great way to add some extra vegetable to your diet. This is some delicious comfort food. Yes definitely a comfort food :) Thanks Dannii. So glad you like it. Thanks Claudia.